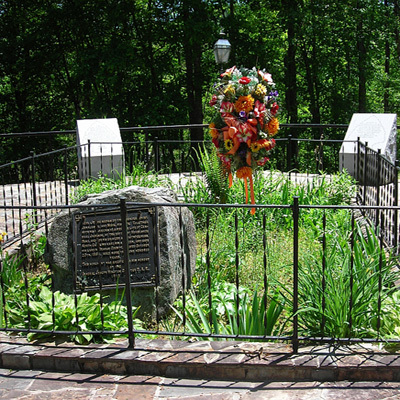 The memorial features a plaque placed in 1910 by the Daughters of the American Revolution to mark the grave of the Cherokee Indian leader Junaluska ( (ca. 1775 - November 20, 1858) and his wife. The grave and its marker have in turn been incorporated into a modern memorial created in the late 1990’s. The 1910 memorial is a simple iron plaque with inscription attached to a large rock resting in a landscape area surrounded by a short iron fence. It commemorates the story (legend) that Junaluska saved the life of General Andrew Jackson at the Battle of Horseshoe Bend in 1814. The modern memorial is formed by paver stones laid around the grave to form a Cherokee seven-pointed star. Around the star stand seven granite markers, one for each clan of the Cherokee Nation. Incised into the lectern top of each marker is an arrowhead inside of which inscriptions detail the life story of Junaluska. Below each inscription is the name of one clan written in the Cherokee syllabary along with the English translation. 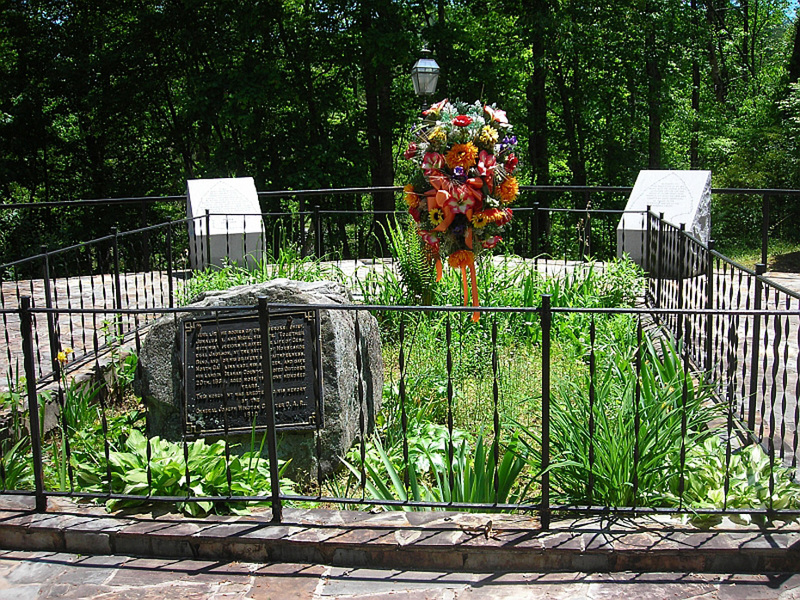 This part of the memorial expands the story of Junaluska’s life to include his role in resisting the removal of Cherokee Indians to Oklahoma along the tragic “Trail of Tears”; a march that saw upwards of 4,000 Cherokee die during the trek. 1910 Plaque: HERE LIE THE BODIES OF THE CHEROKEE CHIEF, / JUNALUSKA, AND NICIE HIS WIFE. TOGETHER / WITH HIS WARRIORS HE SAVED THE LIFE OF GEN- / ERAL JACKSON, AT THE BATTLE OF HORSESHOE / BEND, AND FOR HIS BRAVERY AND FAITHFULNESS, / NORTH CAROLINA MAKE HIM A CITIZEN, AND GAVE / HIM LAND IN GRAHAM COUNTY. HE DIED OCTOBER / 20TH. 1889, AGED MORE THAN ONE HUNDRED / YEARS. Wolf Clan marker: BY A SPECIAL / ACT IN 1846 THE N.C. / LEGISLATURE RECOGNIZED / JUNALUSKA FOR HIS DISTINGUISHED / SERVICE TO THE U.S. AND GRANTED / HIM 337 ACRES, NORTH CAROLINA / CITIZENSHIP, AND $100. ALTHOUGH / NEVER A CHIEF, JUNALUSKA / WAS A RESPECTED LEADER WHO / SYMBOLIZES THE DESIRE OF / ALL CHEROKEES TO REMAIN / IN THEIR HOMELAND. Wild Potato Clan marker: JUNALUSKA (C. 1779-1855) / WAS BORN APPROXIMATELY / FIFTEEN MILES SOUTH OF / FRANKLIN, N.C. NEAR PRESENT DAY / DILLARD, GEORGIA. Deer Clan marker: A FEW DAYS / AFTER HIS BIRTH HE / WAS GIVEN HIS FIRST NAME / WHEN THE CRADLE BOARD / HOLDING HIM FELL OVER. HE / WAS CALLED GU-KA-LAS-KI / (ONE WHO FALLS FROM A LEARNING / POSITION). LATER, AFTER AN / UNSUCCESSFUL MILITARY / VENTURE, HE RECEIVED THE / NAME TSU-NA-LA-HUN-SKI / (ONE WHO TRIES BUT FAILS). Blue Clan marker: ALTHOUGH JUNALUSKA’S / MEETING WITH TECUMSEH AT / SOCO GAP IN 1811 CAN NOT BE / VERIFIED, HE CERTAINLY SENT / WORD TO TECUMSEH THAT THE / CHEROKEES WOULD NOT JOIN AN / INDIAN CONFEDERACY AGAINST / THE WHITES. Long Hair Clan marker: IN 1813, WHEN THE CHEROKEE / RAISED 636 MEN TO AID / AMERICANS FIGHTING THE / CREES, JUNALUSKA PERSONALLY / RECRUITED OVER 100 MEN. AT THE / BATTLE OF HORSESHOE BEND, HIS ACTIONS / TURNED THE TIDE WHEN HE SWAM THE / TALAPOOSA RIVER RETRIEVING CREEK CANOES / AND FERRYING THE CHEROKEES TO THE REAR / OF THE CREEKS. HE IS ALSO CREDITED WITH / SAVING ANDREW JACKSON’S LIFE / DURING THIS BATTLE. Paint Clan marker: ACCORDING TO / THE PROVISIONS OF AN 1819 / TREATY WITH THE UNITED STATES, / JUNALUSKA APPLIED FOR 640 / ACRES AT SUGAR CREEK NEAR / FRANKLIN, N.C. WHEN HIS LAND WAS / USURPED BY WHITE SQUATTERS, / HE MOVED TO THE / REMAINING PORTION OF THE / CHEROKEE NATION. Bird Clan marker: DURING REMOVAL / IN 1838, JUNALUSKA WAS / ASSIGNED TO JESSE BUSHYHEAD’S / DETACHMENT ABOUT SEVEN WEEKS INTO / THE JOURNEY JUNALUSKA DESERTED / LEADING ABOUT 50 CHEROKEES. ALTHOUGH / CAPTURED AND TAKEN TO OKLAHOMA, WITHIN A / COUPLE OF YEARS JUNALUSKA WALKED BACK TO / NORTH CAROLINA. For the 1910 dedication hundreds of people gathered for what was described as an impressive ceremony in spite of inclement weather. The main address was given by the Baptist minister, the Rev. Armstrong Cornsilk with Lewis Smith serving as interpreter. Other speakers at the ceremony were Thomas Carpenter, George B. Walker and J. N. Moody. Young “Indian Maidens” performed the unveiling. The Battle of Horseshoe Bend fought on March 27, 1814 was the major battle of the Creek War. This war, fought from 1813-1814, was a sidelight to the War of 1812. Junaluska’s grave had been long neglected and largely forgotten aside from a small group of Cherokee Indians from the Snowbird Community. In the early 1990’s they began efforts to acquire the property which included a house to be used for a museum. They created the expanded memorial which shows Junaluska in a different context than the 1910 memorial alone. In his essay “Reframing The Cherokee Dead: Removal-Era Cherokee Graves and the Changing Landscape of Southern Memory,” Andrew Denison wrote about the Junaluska grave. He noted that the 1990’s part of the memorial emphasizes Junaluska’s determination and highlighted his role as a resistance leader during the 1838 removal of the Cherokees to Oklahoma along the “Trail of Tears”. Of the two memorials together he wrote that they “engage in mute debate over the meaning of Junaluska’s life and the place of this particular Indian man in American and Cherokee history. The Daughter’s monument is both a gesture of respect and an act of possession. It draws Junaluska into the history of the United States, but only on terms that emphasize American nationalism and white munificence. Junaluska becomes an agent of the empire he and other Cherokees resisted. The newer memorial attempts to revise the old by repatriating Junaluska. It works to restore his reputation as a Cherokee who served his own people, regardless of what he might have done for Andrew Jackson.” Denison then speculates that some Cherokee’s who created the new memorial may have preferred to remove the DAR marker and thus “erasing its Colonial narrative,” but by leaving it in place a “richer site of memory of and a more thorough testament” to Junaluska was created. The memorial and museum are located at 1 Junaluska Memorial Dr , Robbinsville, NC 28771, Robbinsville, NC 28771. Another memorial to "Honorable Chief Junaluska" is located in Maggie Valley, Haywood county, NC.